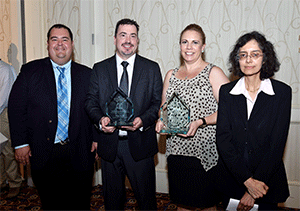 L to R: Will James, FCTO; Nick Barilo, PNNL; Jennifer Hamilton, CaFCP; Sunita Satyapal, FCTO. Each year the Department of Energy's Fuel Cell Technologies Office (FCTO) conducts an annual merit review where scientific experts rate projects for their value. At this year's FCTO review, Pacific Northwest National Laboratory (PNNL) project manager Nick Barilo was recognized for his work in developing fuel cell safety training resources. As consumer and industrial adoption of hydrogen fuel cells grow, there's a need for reliable information on how to safely handle the technology. A wide range of professionals, from code officials to first responders to fueling station managers and fork lift operators now interact with fuel cells. As the PNNL Hydrogen Safety Program Manager, Barilo plays a vital role in the development of hydrogen safety best practices. In the last year, Barilo oversaw the creation of a first responder training resource and a hydrogen tools web portal, through which professionals tasked with designing, approving, or using fuel cell technology can gain helpful information. Projects were evaluated based on how much they contributed to the advancement of the DOE's missions and goals. A complete list of FCTO annual merit review winners can be read at: http://www.hydrogen.energy.gov/annual_review15_awards.html.